If you have any packet loss on your line any increase in latency will have an exponential effect on the throughput due to re-transmits taking that much longer. I presume the best way to check for packet loss is to use WinMTR - which host should I test to? Have asked a teamleader to contact you and do some iperf testing so we can see if there's significant loss. Just to update that the IPC change for JHB was done this morning, CPT is scheduled for Monday. I can backup the claim about packet loss. I have ~3% loss every evening on my line. 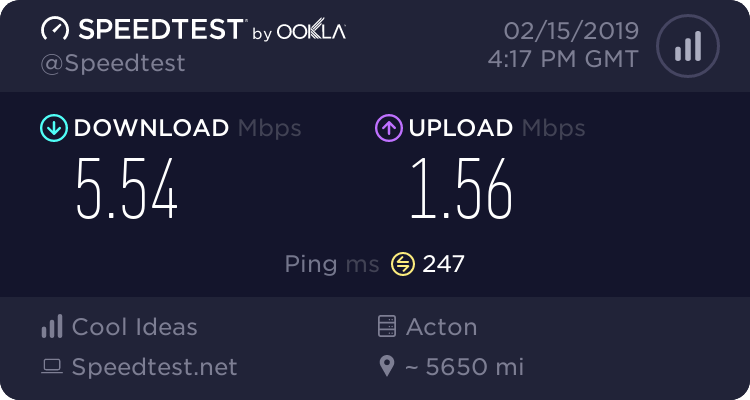 That's enough to drop my 100mb line down to 0.8mb throughput. Its not pleasant. Your best bet is to do iperf tests. I've found through my tests mtr doesn't always show the packetloss, iperf does. I think we going to be waiting a while, a week at least. With all the loadshedding causing havoc with networks its unlikely they'll get any sort of accurate results until things settle down. And what might that be? Don't tease us! Sorry for the silence, we let our customers know through our support channels and thought it would be best to refrain from sharing our findings until Octotel shared their report. You get your copper in? How's it looking? I come back home, no Internet. Tried to log in on the Cool Zone, my account does not exist anymore! So I'm currently using Vodacom LTE roaming with my French contract which allows me 25Gb a month in SA for 19,99€. By the way, I'm pretty sure of the answer but you are the person following me on Twitter and commenting on my fibre issues there as well, right? @PBCool - does this reflect any issues?